Trust is lead partner in East Surrey Pathway to Employment. Carla Shelton, Manager, East Surrey Employability Pathway, with Banstead CA colleagues. Carla Shelton’s work as manager of the East Surrey Pathway to Employment is a good example of Raven Housing Trust’s commitment to the community it serves. The project is for anyone aged 18-64 living in housing insecurity. It aims to help them move closer to the jobs market or into work. Its focus is reducing barriers to employment by confidence building and providing opportunities to learn job and life skills. 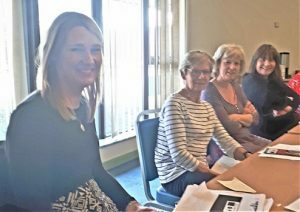 Carla was guest speaker at our both our Redhill and Banstead volunteers’ meetings last month. She explained how the service is tailored to the needs of the individual from a range of support options including: support with childcare, stress management, job search skills, volunteering & work placements, physical well-being courses and financial management. To be accepted on the programme you have to be referred by local support organisations such as Citizens Advice, local councils or social landlords. Proof of right to work in the UK is needed and evidence of unemployed or inactive status. Our team was pleased to learn how East Surrey Pathway might help our clients in the future. At Citizens Advice Reigate & Banstead we work closely with many local charity and public service organisations. Raven’s partners in the project are East Surrey Domestic Abuse Service (ESDAS), Employment Support & Retraining Agency (ESRA), Surrey Chamber of Commerce, the YMCA East Surrey, and Reigate & Banstead Council.